June 20, 2013 0 comments on "Elderberries for Every Garden"
If you have room for only one edible plant, consider growing elderberries. This arching eight-foot tall shrub is easy to grow, anchors the mixed border with its bold compound foliage and flowers, and of course, provides glorious clusters of shiny, dark purple berries. Elderberries come in a variety of cultivars and species. The American species is Sambucus canadensis. Look for this species if you want to harvest as many berries as possible. ‘Nova’ and ‘York’ are the two cultivars that set the biggest crops. Although these varieties are self-fruitful, you’ll get a bigger crop with two plants because they cross-pollinate one another for larger yields. Elder flowers are used for fritters, they’re great for bouquets, and the berries make the most intensely colored claret wine you’ll ever see. You can eat the berries off the shrub, but they’re better in jams, syrups and pies. Throw some berries into a peach pie for a special summertime treat. The European species is Sambucus nigra. This species is parent to some spectacular new hybrids, including the 2006 introduction ‘Black Lace.’ The purple-black foliage is deeply imbricated and looks like a cutleaf Japanese maple. This plant is similar to ‘Black Lace’ in coloration, but the leaves are oval. The showy drooping berry clusters on both varieties must be cooked before eating. They’re great for jams and syrups. A S. nigra cultivar called ‘Pulverulenta’ has pale green leaves mottled with creamy white. It’s a beautiful shrub for a woodland garden. The flowers are typical white elder cymes that are perfectly showcased by the marbled foliage. You’ll get enough berries to satisfy birds, but not enough for jam or pie making. Try growing the beautiful green-white Clematis florida alba semi-plena into the branches of this variegated shrub for an extra visual kick. Another species in the elderberry family is Sambucus racemosa. Native to the northern latitudes of North America, Europe and Asia, this elderberry bears red berries that are best left to the birds. A spectacular yellow-leafed cultivar is ‘Sutherland Gold’, with ferny foliage that’s perfect to lighten up a shady corner in the garden. If you want to attract wildlife, elderberries are a great choice. Butterflies are frequent visitors to elder flowers, and elderberries are a favorite with many birds. 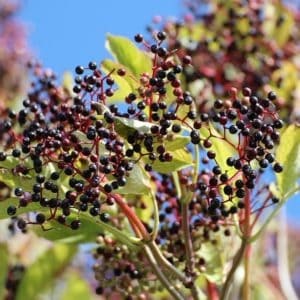 Woodpeckers, bluebirds, cedar waxwings, orioles and grosbeaks will choose elderberries over anything else in your garden. Elderberries have no diseases to speak of, they’re very adaptable to a variety of soil conditions, moisture levels and sunlight, and deer tend to leave them alone. They grow well in Zones 4-9. You can prune them back every year after fruiting to keep them in check. And don’t forget to bring in branches of flowers and berries for striking bouquets. Follow my gardening board on Pinterest.